Capture2Text enables users to quickly OCR a portion of the screen using a keyboard shortcut. The resulting text will be saved to the clipboard by default. Position your mouse at the top-left corner of the text that you want to OCR. 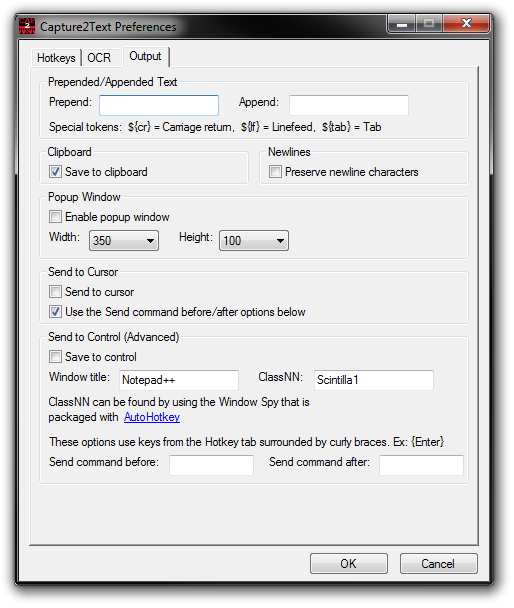 Press the OCR key (Windows Key + Q) to begin an OCR capture. Move your mouse to resize the blue box over the text that you want to OCR. 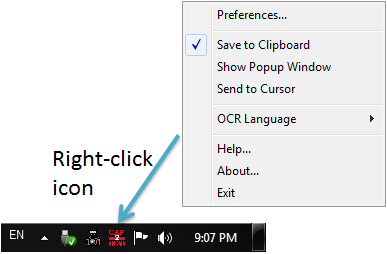 Press the OCR key again or left-click to complete the OCR capture. The OCR'd text will be placed in the clipboard. To cancel an OCR capture, press ESC. To move the entire OCR capture box, hold down the right mouse button and drag. To nudge the OCR capture box, use the arrow keys. To toggle the active OCR capture box corner, press the space bar. 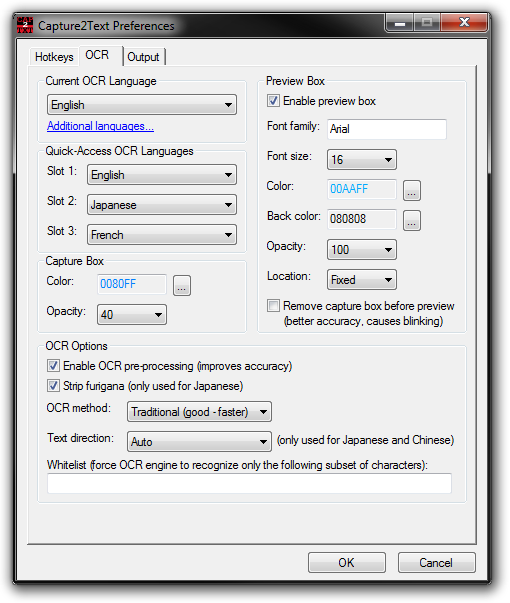 To change the OCR language, right-click the Capture2Text tray icon, select the OCR Language option and then select the desired language. To quickly switch between 3 languages, use the OCR language quick access keys: Windows Key + 1, Windows Key + 2, and Windows Key + 3. When Chinese or Japanese is selected, you should specify the text direction (vertical/horizontal/auto) using the text direction key: Windows Key + W. If auto is selected, horizontal will be used when the capture width is more than twice the height, otherwise vertical will be used. The text direction also affects how furigana is stripped from Japanese text. (For Japanese) When OCR pre-processing is enabled, by default, Capture2Text will attempt to strip out furigana. You may disable this behavior in "Preferences... -> OCR -> Strip Furigana". The 3 Quick-Access OCR Languages. Capture Box color and opacity. Enable/Disable the preview box and change its colors, font, opacity and location. OCR Method (quality vs. speed). Change the text direction (used for Chinese and Japanese). Enable/Disable stripping of furigana (for Japanese). By default, the OCR'd text will be placed on the clipboard. You also have 3 more ways to output the text. To send the text to a pop-up window you can right-click the Capture2Text tray icon and select Show Popup Window. To send the text to whichever textbox currently contains the blinking cursor/I-beam, right-click the Capture2Text tray icon and select Send to Cursor. (Advanced) To send the text directly to a window/control (for example, Notepad++), first fill in the Send to Control settings in the Preferences dialog. Text to prepend/append to the captured text. Enable/Disable outputting to the clipboard. Enable/Disable outputting to a popup window. Popup window properties (default width and height). Enable/Disable sending the output text to the cursor. Enable/Disable outputting to a control. Additional command to send to the output control. Right-click the Capture2Text tray icon in the bottom-right of your screen and then select the "Preferences..." option to bring up the Preferences dialog. Sometimes Capture2Text consistently makes the same OCR mistakes such as recognizing an "M" as "I\/|". By editing the substitutions.txt file in the Capture2Text directory, you may tell Capture2Text to substitute one text string for another text string. To create a substitution regardless of language, add the substitution to the "All:" section. You may disable a substitution by adding a "#" in front. When done editing substitutions.txt, either restart Capture2Text or switch language for the substitutions to take effect. output_file - The OCR'd text will be written to this file if specified. 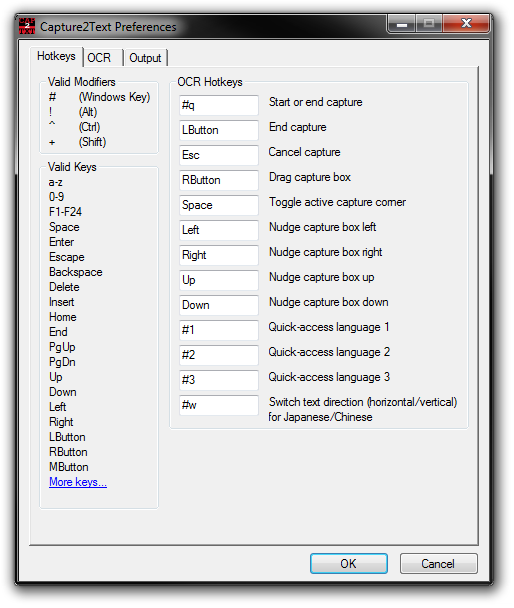 Capture2Text will read settings.ini to determine settings such as OCR language and output options (clipboard, popup, etc.). 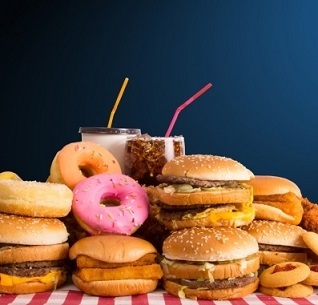 2,005 8,214 Capture2Text <img src="https://www.oldergeeks.com/downloads/gallery/thumbs/Capture2Text1_th.png"border="0"> Nov 09, 2018 - 12:41 4.6.0 58.56MB ZIP , out of 23 Votes.